We bring you a comprehensive listing of all venues in the Metro Vancouver Area and beyond! Heritage Valley Resort - They have pretty much phased out weddings in favor of a destination health and wellness mountain resort. Burnaby Lake Rowing Pavillion - Capacity 200, <$1000 for 8 hours, includes tables and chairs. Can bring own caterer & liquor. Eagle Creek at Burnaby Mountain Golf Course - beautiful tucked away outdoor venue (golf course, pond, flower beds), indoor reception area is quite nice too and very reasonably priced. There is an indoor backup (cafe) for a ceremony if it's raining. Staff seem organized and friendly. The food is delicious. Cannot bring own food/liquor. Firefighter's Club (Burnaby) - includes almost everything you need for a ceremony (even much of the decor) and reasonably priced (I think it was ~$70/head including everything), but the email indicated that there was a minimum guest number. SFU Diamond Alumni Centre - Voted as the #2 reception venue by Dynamic Weddings in 2013. The setting is like no other and worth every penny. Great food and service. Highly recommended. Best Western Coquitlam Inn - Must use their own caterer/liquor. Prices start at $30 per plate. Not much of a dance floor. Minnekhada Lodge - Best for about 50 or 60 guests, this hidden heritage building will surprise you with it's elegance. Vancouver Golf Club - Yes, it's located in Coquitlam. For 100 guests, the price worked out to $10,000 minimum (minimums on their food/drinks). Very nice facility. Westwood Plateau Golf Club - Voted as the #4 reception facility by Dynamic Weddings for 2013.
Who would have thought that such a beautiful setting would be so close? The Westwood Plateau golf Club, located at the top of Eagle Mountain in Coquitlam, BC is a terrific setting for a reception! With breathtaking views and plenty of terrific spots for photos, this location leave little to be desired. You will be blown away when you set your eyes on the seemingly endless assortment of food beautifully displayed for all to enjoy. We have entertained at this facility many times and continually hear terrific feedback. It's hard to find a golf club that can match the beauty, elegance, and quality of service to be enjoyed at Westwood Plateau! Executive Hotel - North Road - Very good value for your neighborhood hotel. Delta Town & Country Inn - They have two banquet rooms, an indoor ceremony room and a gazebo for ceremonies. It's very affordable and comfortable. East Delta Community Hall - For those that are looking for an affordable and simple event. Beach Grove Golf Club - Voted as the 3rd most recommended venue in 2013 by Dynamic Weddings. Highly recommended. Terrific service and value! Sunny Tsawwassen is not as far as you think. Beach Grove Golf Club will make your drive out well worth it. The club house is beautifully constructed with designer slate, rock and woodwork. You will love the view of the gorgeous golf course directly from the balcony off of the banquet hall. seem to always be customized to the customers desires and always delicious. I've always appreciated their more than friendly bar and service staff. If you want personal service, great food and terrific value then Beach Grove is the place to be. Tsawwassen Springs - Currently under construction. Harrison Hot Springs Resort & Spa - Voted to the top 5 venues in 2014, Harrison is a unique blend of nature and modern elegance, rarely seen. Endless mountain and lake views make this venue a nature lovers paradise! Your surrounded by nature but you enjoy the modern amenities and luxury offered by the resort. Terrific photo opportunities are abound with the stunning scenery. You and your family will enjoy a relaxing stay in their resort and spa with the hot pools. Only 1 1/2 hours from Vancouver, consider it a local destination wedding. This is one of the most under rated facilities with a beautiful banquet hall with large windows and a great setting for outdoor ceremonies. There service is top notch and their rates are very competitive. The Langley Golf & Banquet Centre will pleasantly surprise you with it's beautiful decor and style perfect for your wedding celebration. You will love the breathtaking views of the rolling countryside, gardens and lawn. Enjoy elegant style, great food and personalized service. Multiple rooms that seat up to 250 people. Be prepared to have the pleasant staff exceed your expectations. Langley Seniors Centre - <$1000 for all day rental. Newlands Golf & Contry Club - Good for those that just want a simple wedding with an all inclusive package. Willoughby Manor - Basically it's a B&B on an acreage and has the ability to do outdoor weddings. Fraser Valley Community Hall - hall has large windows and is spacious, with a dance floor and stage. Large bathrooms. Kitchen is a bit small. Right near a gorgeous park that you can use for an outdoor ceremony if you wish, but you have to provide your own chairs for that. PA system included. Everything must end at 11 pm. It's in a senior's housing area, so respect for the neighbours is emphasized. Professional coordinator. Capacity 150. Can bring own food/liquor. Glenbrook Park Community Centre - Dates booked up fast. Coordinator was hard to reach. Lovely facilities & garden, ~$1000 for a day's rental, can bring own food/liquor. Westminister Club - Capacity is 140. Available to non-members. Venue price is <$700 including many decorations. Must use their caterer/liquor, though you can bring your own wine ($8 corkage fee). Metro Hall - Very popular for a variety of events. Great for those looking to have a unique and/or simple wedding. Affordable. Good bang for your buck. Roma Hall - Voted as the fifth best reception venue in 2012 by Dynamic Weddings. However, it's the BEST HALL by far. This hall provides the best value out of any hall we've come across. It is recently renovated, Italian owned and operated, the food is amazing, you can bring your own alcohol, lots of parking and centrally located. You would not believe that this hall was built over 80 years ago, especially once you enter the banquet hall which was fully renovated a few years ago but quality Italian artisans. The hall is run by the Italian Mutual Aid Society who work tirelessly to provide the most personal service available. Their fully renovated and full service kitchen allows their in house catering staff to produce the best mouth watering home made lasagna you have ever tasted! They have a wonderful bar which you can stock and service yourself, or you can utilize their own bartenders. It's centrally located in New Westminster and has ample free parking. Those looking to save some money, but still expect quality, you will get it here. I appreciated the value so much when I married that I chose the Roma Hall for my own reception venue. Pinnacle Hotel At The Pier - Service is top notch at this beautiful hotel. You will be treated like royalty by the classy staff all at a reasonable rate. Golden Eagle Golf Club - Voted as one of the top venues for 2014, Golden Eagle is a pure gem. Set amongst the surrounding mountains and gorgeous vistas, the experienced is literally heightened when you experience a helicopter tour arranged by the venue. Owned by the Aquilini Group, this team knows how to impress and exceed expectations. Located just 45 minutes from Vancouver, it's hard to beat the experience and surprising great value at Golden Eagle. Meadow Gardens - Must use their own caterer/alcohol, food/drink minimums. Our 100-person estimate ended up being >$5000 minimum. Pitt Meadows Golf Club - Beautiful scenic surroundings, the Pitt Meadows Golf Club is a hidden gem. Swan-e-Set Bay Resort & Country Club - The setting is truly amazing. It's hard to find such a gorgeous facility. It's worth the drive. John M.S Lecky UBC Boathouse - Voted a top wedding venue by Dynamic Weddings for 2014. Officially named the John M.S. Lecky UBC Boathouse, in memory of the former UBC rower who won silver in the 1960 Olympics. Just one look at this unique building and you'll clearly see why. Situated near the Richmond Olympic Oval on the banks of the Fraser River, this floating building is an ideal setting for a wedding. Lovely views and intimate, it's hard to find a setting such as this. The ceremony can be held at the attached dock and photos can be taken on the dock, building and surrounding parks. This stunning venue has been a runner or finalist in the BC Wedding Awards 3 times and is surely a matter of time before it is voted as the winner. 5 Star Catering - Capacity 210, rental $0-$600 depending on the catering package you get. Facilities renovated in Sep '09, so they're nice and new. Overlooks a golf course. Includes all linens, setup/takedown, many decorations (arches/indoor trees etc. ), licensed until 1 am (bar service available), day-before decorating. Must use their caterer/liquor. Food is ~$30/guest, buffet. Beecher Place - If you want to experience amazing waterfront views, terrific service by their coordinator Vanessa and fantastic food; all at an affordable price then check out this beautiful venue. Peace Arch Provincial Park - How does $200 for a whole day rental for a building at the provincial park complete with a fully equipped kitchen, halls, chairs, tables, fire place and even a fire pit sound? Well, if you thought "awesome" then you are not alone. Registration begins first thing in the morning on January 2nd each year. Most spots fill up in the first hour so get your ducks in a row and you could have a terrific celebration for a small investment. Sheraton Vancouver Guildford Hotel - Voted as one of the best venues for 2014, the Sheraton Guildford hotel is a rare 4 star luxury hotel found in this region. With exceptional service and exquisite food, this hotel leave little to be desired. The recent room renovations make this the ideal place to retreat after a night of celebrating! Voted 5 stars on Trip advisor for wedding and reception venues, you will be hard pressed to find a better hotel in this region. Aberthau Heritage Mansion - A lovely heritage building. BRIX - Voted as a top venue for 2014, BRIX is a rare find. It's hard to find an intimate, out door ceremony and reception site in the heart of Yaletown in downtown Vancouver...except for BRIX Restaurant. Can you imagine having your wedding in a 1912 heritage building? They have the a gorgeous glass roof courtyard adjacent to the restaurant. The brick facades and rustic look call for ideal photos for your special day. The delicious food, comprised mainly of local ingredients, ads to the warm and inviting surroundings. Brock House - Right on the beach but small and little privacy. Unfortunately, you have to use their in house DJ which is a non starter for some people. Cecil Green Park - Voted as the #2 reception venue by Dynamic Weddings in 2012. Wow! This beautiful heritage house has been transformed into one of the most beautiful wedding facilities in the world. Amazing! The "House On The Cliff" is more than a house on a cliff. It's a magnificent mansion with beautifully manicured gardens with an ocean view. How could you get any better than that? It's ideal for outdoor weddings! It has a beautiful patio complete with a bar, perfect for cocktail while you enjoy the sunset. We've even had dancing out on the covered patio in hot summer nights. Given it's beauty, one can easily overlook the lack of air conditioning and limited seating capabilities. Would you like to buy this magnificent property? Well, if you had $9,000 in 1940 it would have been yours. UBC is fortunate to own this renovated gem as they received it as a donation from Mr. Cecil Green who studied at UBC in the 1920's. He later became the co-founder of Texas Instruments. Coast Coal Harbour Hotel - I was amazed at the amazing value at this new modern hotel. It's chic but surprisingly reasonable. Croatian Cultural Centre - Many halls in this centrally located and affordable facility. It's worth a look. Fairmont Hotel Vancouver - By far, the most classy facility and service in Vancouver today, Hands down the best! Dynamic Weddings voted them the #1 reception facility in Vancouver for 2012. Centrally located in downtown Vancouver, BC, The Fairmont Hotel Vancouver is a spectacular venue for any elegant event. Our photographers have no problems shooting elegant shots with the beautiful architecture. The food is world class! Most buffets don't often have a reputation for excellence, but this hotel sets themselves apart with fresh and top quality, and not to mention delicious food! You must have the lamb! Although it retains most of it's 1930's charm, it is scheduled for major renovations this year. It will no doubt retain it's elegance with modern amenities. The rooftop banquet hall is newly renovated and is the new hot spot for receptions. The venue is stunning but the best thing about this venue is it's people. You will feel it the moment you interact with any of it's professional staff. Class and nothing but. 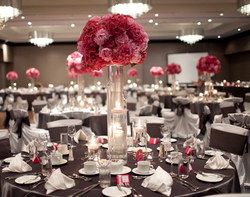 Fairmont Pacific Rim - Voted as one of the top 5 wedding vendors in Metro Vancouver by Dynamic Weddings in 2013. Wow! Glass from floor to ceiling. State of the art facility. World class! If you want modern cosmopolitan syle you will get it and more at the Fairmont Pacific Rim. Our first experience was when we DJ'd & MC'd the wedding reception of Paul & Patti Korzilius, manager of Bon Jovi at the Pacific Rim. The decor was fabulous and very inviting. The floor to ceiling windows added to the ambiance with the amazing view! Don't just take it from us, the Fairmont Pacific Rim was also named #1 in Canada by Travel + Leisure World's Best Reader's Survey. It is luxury at it's finest. From our experience, everything done at the Fairmont Pacific Rim is 5 star across the board. The view of Vancouver harbour and the North shore mountains is spectacular. Be prepared to have your expectations exceeded at one of Vancouver's newest and best hotels. Famee Furlane - Very popular with the Italian and Portuguese community. The hall is in a residential area and parking is very difficult. It's upstairs. Heritage Hall - Beautiful architecture. Capacity 150, <$1200 for the day. Hellenic Centre - If you are having a very large wedding then this hall is very much worth a look. H.R. MacMillan Space CentreItalian Cultural Centre - Recently renovated. Multiple halls. Main hall can accommodate 900 guests. Hycroft Manor - Voted as the #1 reception facility in 2013 by Dynamic Weddings. Hidden away in the upscale Shaughnessy neighbourhood, you will find this beautiful and elegant heritage mansion known as Hycroft manor. Home of the University Women's Club of Vancouver, this Edwardian clubhouse is a terrific example of Vancouver's elegant history. Built in 1909, it has a view terrace, heritage garden, juliet balcony and dressing room suite perfect for both wedding ceremonies and receptions. This upscale, yet relaxing venue provides surprisingly competitive rates with professional, caring and accommodating staff. If you want elegance, class and character for your celebration, Hycroft is a no brainer! Law Courts Inn - We voted the Law Courts Inn as the #3 reception facility in 2012. Amazing service and food. They customize everything for you. Highly recommended. Who would have thought that you could have a banquet at the law courts in downtown Vancouver? Well, for those that are lucky enough to know enjoy fabulous service from two Italians, Carmela and Sylvana. Their longtime staff are efficient and able to modify their layout and menu for each guests unique needs and taste. I've eaten an amazing assortment of cultural dishes from Italian to Indian to Persian! The Law Courts offer the restaurant upstairs complete with a terrific view, or the great hall downstairs which can accommodate an endless number of guests. What ever your needs, the accommodating staff and the Law Courts are there to help! ​Roedde House - This is an absolutely lovely heritage house for a classic celebration. Roundhouse Community Arts & Recreation Centre - Nice spot in Yaletown but you have to supply everything. I mean everything. Sheraton Vancouver Wall Centre - Perhaps one of the most beautiful hotels in Vancouver. Amazing food. Centrally located. Scottish Cultural Centre - Can accommodate 400 people. Very popular with Italian and Portuguese weddings. Teahouse In Stanley Park - Not typically a reception venue but a nice restaurant for small parties. Terminal City Club - Very nice but pricy facility. UBC Golf Course - Great location. Great outdoor ceremony options as well. Very good service. Recommended. UBC Botanical Gardens Vancouver Convention Centre - This newer building is right on the waters edge and boasts terrific views. Highly recommended. Villa Amato Ballroom - Popular with the Italian and Portuguese communities. Don't use their DJ. Hollyburn Country Club - An exclusive facility. Very nice.